A panel of hydrogeologists is scheduled to discuss how large-scale production in the Carrizo-Wilcox Aquifer will impact water levels and landowners in the District. Kevin J. Spencer, P.G., is the President of R.W. 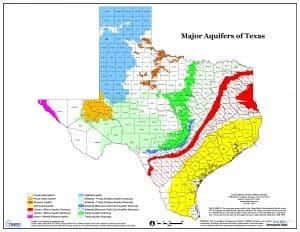 Harden and Associates, Inc. and has more than 25 years of experience developing fresh and brackish groundwater resources. Spencer said his presentation will include a series of illustrations that show how an aquifer like the Carrizo-Wilcox responds to groundwater withdrawal. He has been the principal investigator and project manager for the development of large-scale pumping of groundwater from public and industrial supply wells in Texas. Spencer has also evaluated the availability, cost and impacts from additional groundwater projects. Toya Jones, a hydrogeologist for Intera, will also be on the panel. Jones has 30 years of experience in aquifer characterization and development of numerical models that measure water resources. She has served in key technical roles for the development of groundwater availability models for numerous aquifers in Texas, where her efforts include compiling and analyzing aquifer water-level data and establishing regional groundwater flow and pre-development aquifer conditions. To complete the panel, Chad Norris, an aquatic biologist, will be representing the Water Resources Branch from Texas Parks and Wildlife Department. Norris has experience in groundwater policy and management, conserving and restoring springs, and has helped in creating aquatic- and spring-related Habitat Conservation Plans. Robert Mace, Deputy Executive Administrator of Texas Water Development Board, will moderate the panel. For those interested in the Post Oak Savannah Groundwater Conservation District’s new Groundwater Well Assistance Program (GWAP), a panel is set to discuss what the program is designed to do and who can participate. Steven Wise, Vice President of the Post Oak Savannah GCD Board of Directors, will discuss what the GWAP is and how it pertains to citizens of the District. Wise was appointed to the POSGCD Board of Directors in 2013 and was elected Vice President of the Board in 2017. He is the chair of the DFC Committee, which is still developing the program. The primary purpose of the GWAP is to restore a water supply to well owners in the District who own a well that has experienced significant adverse impacts caused by aquifer-wide pumping in Groundwater Management Area 12. The program will also help improve the POSGCD monitoring program. Wise said that by attending the GWAP panel, residents of Burleson and Milam Counties will learn how the program protects well owners and who is eligible to participate. Gary Westbrook, General Manager of POSGCD, will be on the GWAP panel with Wise. They will discuss when the program is set to be adopted and the processes available to well owners to be included in the program. Citizens of Milam and Burleson Counties, as well as surrounding areas, can benefit from attending the Groundwater Summit. Post Oak Savannah GCD organizes the annual event and invites groundwater experts from across Texas to come speak at the local level. In addition to the topics mentioned above, this year’s Summit covers a variety of issues, such as how Groundwater Conservation Districts collaborate within Groundwater Management Area 12, an overview of Groundwater Availability Models (GAMs) and how they are developed and used, an overview of Desired Future Conditions (DFCs), an introduction to Post Oak Savannah’s new Rainwater Harvesting Grant Program, and an update on the POSGCD well-monitoring system. For any questions, please contact the POSGCD office at 512-455-9900, or email at admin@posgcd.org. Please RSVP to your County Extension office by August 8th. Burleson County, 979-567-2308. Milam County, 254-697-7045. For a detailed agenda of the Summit, please visit https://posgcd.org/outreach/2017-milam-burleson-counties-groundwater-summit/.